Ryan: Tell me about your upbringing in the Netherlands, were you raised near the places you photograph? What is your connection to the sites that you choose to photograph? Thieu: I was raised in Tilburg in the south of the Netherlands, an industrial city in the heart of the province of Noord-Brabant. The prefix Noord (North) indicates that there must be a South and there is, in Belgium. In the past, North Brabant was part of the duchy of Brabant. Present-day North Brabant was adjudicated to the Dutch Republic according to the 1648 Peace of Westphalia, while the reduced duchy remained part of the Southern Netherlands until 1830, when it was incorporated into Belgium. I emphasize these facts to express the idea that the Dutch-speaking region where I live is one culturally coherent area. Furthermore, it speaks to my interest in the historical background of the places I photograph. The Netherlands is a small country, so I was both raised and live near the places I photograph. For example, when I bike from Tilburg to the south, it takes a little bit more than a half-hour to reach the border of Belgium (10 miles). Notably, the climate, natural scenery and language do not change in this short distance. However, things like architecture, land use and environmental planning are very much different. Thus, there are considerable amounts of cultural differences that transpire within a very small geographic area. It is worth mentioning that a significant number of my pictures are taken in Belgium, just on the other side of the border. 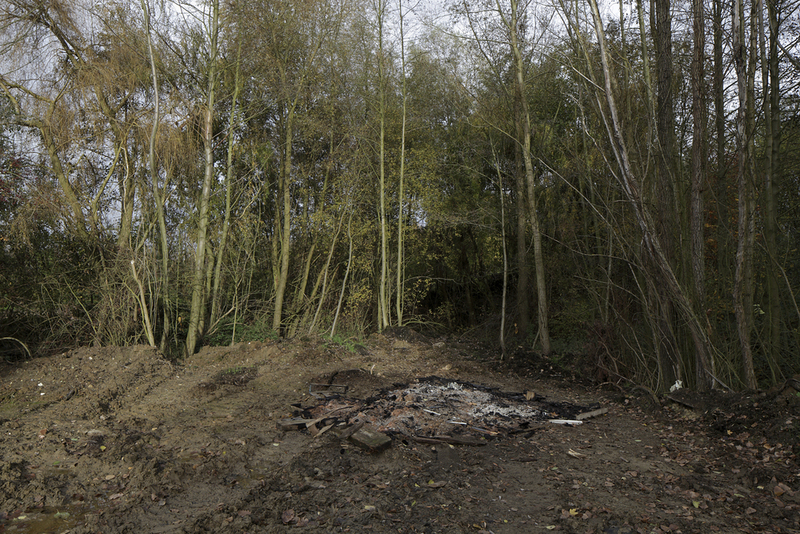 So ‘Dutch landscape’ as a subject of my photographic works should be considered in a broader sense. The sites I choose to photograph are mainly rural and suburban places in the south of the Netherlands (the provinces Brabant, Zeeland and Limburg). Many of these places I have known since childhood and most are considered countryside. I feel that the rural orientation of my images allows me to see how we have changed and how we continue to change relative to our surroundings. In the countryside, I feel the tension between nature and culture is at its best. For me, it is in these places that the signs and traces of human presence are juxtaposed in an interesting way relative to the natural world. In a sense, non-natural and manmade objects seem a little more identifiable and recognizable relative to the rest of the landscape; they stand out. I say this also because the countryside is an environment where you can still see and feel the natural soil below your feet. However, in the Netherlands, all you have to do is look down for evidence of human intervention in the land as most of our farmland was reclaimed from the ocean. Ryan: I recently watched a documentary about the American photographer Gregory Crewdson. He often drives around in the same neighborhoods over and over until he sees or feels something that compels him to stop and make an image. I get the sense that you navigate through Dutch farmland in somewhat of a similar manner? How do you move about the land and what compels you to stop and make an image? Thieu: I am familiar with Gregory Crewdson’s work, although my work is very different. I see a similar interest in the mystery of everyday subjects and in the sense of place, but my work is neither with narrative purpose, nor with elaborately devised settings. However, there are some parallels between the way we scout locations for our images. I tend to move around in certain areas over and over again with the changing light and through the different seasons. I am in search of the right setting and light that compels me to stop and make an image. I should mention that the way I move around is very important to me. Preferably, I like to travel by foot or by bike because it enables me to feel a deeper sense of connection with the landscape. This is a much different experience than watching the landscape unfold through a windshield. Also, for this reason, I use a 35mm format (digital) camera and a lightweight tripod, both are relatively easy to carry when walking. My lens of choice is a 24mm wide angle lens in order to convey the feeling of being in a landscape rather than looking at it. Ryan: It is clear that you spend a lot of time investigating narrow geographies within the Dutch landscape. I believe that intense and focused investigation can lead to interesting observations and insights in relation to subject matter. What insights or knowledge have you learned while photographing the Dutch landscape? Thieu: The Dutch landscape is a very small-scale landscape, it is densely populated, industrialized and crammed with all kind of built objects. Therefore, it is literally filled with wonder as it is bustling with activity. What I observe in the Dutch landscape is a sense of endless transformation. For me, this brings to mind the popular saying “God created the earth, but the Dutch made the Netherlands”. In answering your question, it is important to note that my photography is driven by an emotional involvement with places rather than by an attempt to gain some knowledge. Reflecting on this, it is and was never my goal to assert anything conclusive about the Dutch landscape. Thus, I don’t know whether my insights are that sensational or worth mentioning? After so many years of photographing the Dutch landscape, the best I can say is that the Dutch landscape is a thing of tremendous beauty. Ryan: Do you think that our interactions with agricultural land have changed? If so, where do you see evidence of this change? Thieu: I cannot judge whether our interactions with - Dutch - agricultural land have changed very much. I am not a farmer, countryman or scientific researcher, but just someone who wanders around the countryside and someone who derives great pleasure in looking at the world through a camera. However, I have noticed a growing attention to environmental issues and ecological aspects related to land use. Born from self-preservation (battle against water and pollution) but also from a renewed interest in nature in The Netherlands (new nature areas have been artificially formed). You should bear in mind with regard to ecological aspects and other developments that some of them are visible, however a lot are not. I believe that the photographic image is only really capable of revealing the superficial or surface level of things. Thus, as a tool, the medium is somewhat limited in its capacity to comprehensively and accurately document environmental change. In photography, there is always the potential for some discrepancy between what we see and what is actually conveyed. Therefore, we often still need the aid of storytelling or language to elaborate on subjects and what is actually being viewed in images. So, I wonder whether a medium like photograph is an appropriate means for documenting or providing evidence of ecological change? Ryan: One of the many qualities I notice in your work is your superb control of light. It is evident that you put a lot of energy and attention into controlling the intensity of light and tone of your images. Tell me more about your process for creating consistent exposures and soft image tones? Thieu: My lighting decisions are all based on location as I believe that light and tone are captured in a singular unique moment in time. At home, my only goal in editing my images is to produce the light and colors that I saw on location or at least according to my recollection of it. In order to make this possible, I always shoot in raw mode to capture the physical information about the light intensity and the color of the scene. When the contrast in lighting is extreme, I take several images with different exposures. Subsequently in Photoshop, I can combine the relevant parts of the image. Ryan: Ultimately, what motives or strategies lie behind your lighting choices? What do you aim to communicate to viewers through subtle image tones? Thieu: I prefer to take my photos with low light conditions, predominantly at sunset or at dusk. My choice for low or subdued light conditions has to do with my interest in the experience of a location. Many times at dusk, silence can descend on the landscape and at the end of a working day this contributes greatly to the atmosphere of a place. This helps define the experience of a location, I mean feeling the distinctive atmosphere or emotion that a location evokes; the ‘genius loci’, ‘spirit of the place’ or - as you like - ‘sense of place’. To me, the genius loci is a very meaningful aspect of those locations where I choose to wander around with my camera. Ultimately, the subdued colors and subtle tones inherent to low light conditions enhance the expression of an atmosphere of a place in my imagery. Ryan: In scanning your work, it is evident that strong horizon lines are a prevalent part of your compositions. It is also apparent that you devote a lot of compositional space to the sky. I am curious about your thoughts on both of these aspects found in your photographs? Thieu: The Netherlands is extremely flat, there are some hilly areas in the Southeast corner of the country, but even in these regions you can see for miles around. Dutch flat horizons have regularly little to offer, so the eye automatically wanders to the sky. During my wanderings, my eyes often involuntarily linger at the sky. Out of mere fascination, but of course also in order to look for the development of light and weather for my photography. Thus, the combination of strong horizon lines and unbroken expansive skies are characteristic of the Dutch landscape. Quite simply, I believe that these landscape features naturally train the eye to these focal points and therefore heavily influence my compositional choices. A second and far more significant reason has to do with the mood of a place. As I stated, the “genius loci” is a very meaningful component of landscape to me. The sky strengthens the expression of mood in a landscape while simultaneously conveying a feeling of transience and impermanence in all human enterprises. I am very interested in the history of a location or landscape; I read as much as I can about it and try to imagine how people before our times used and changed the landscape. In my vision, the skies – although highly variable and changeable – are the timeless elements in the photographic image; they are never the same but substantially not changed since ancient times, thus eternal in contrast with volatile earthly things. Ryan: I know that you are keen on documenting seasonal changes in landscape by repetitively photographing the same locations over and over, can you elaborate on this practice? Thieu: I return frequently in different seasons when I feel a special bond with a place or when there is something in the setting that holds my attention. In this case, I am very interested in scenery that is transformed through development over time. I try to investigate this by photographing places in different seasonal circumstances and light. Usually, what I encounter is gradual change when revisiting a location over the course of many years, but sometimes there can be such startling change that a place is no longer of interest to me. For example, when a visually dominant building or impressive tree has disappeared. At the same time, this revisiting of a place is simply an investigation to find out what makes a location unique, notable and interesting. Ryan: It seems that many photographers produce work via a motivation to see, experience and construct something novel or new from their reality. Thus, experiencing something for the first time is one method for easily generating and documenting new experiences. One could easily assume that the act of photographing the same location over and over might challenge this concept. Do you feel that viewing the landscape in a repetitive fashion diminishes your capacity to document what you are seeing in a meaningful way? Thieu: I believe that landscapes never become completely familiar; irrelevant of how often they are viewed. The ever changing light and the moving seasons always seem to change the way we see certain locations. Even more, the changing light and seasons make us notice new aspects, details and points of view. Looking at the introduction of your question, it can also be argued that experiencing something for the first time could also have the risk to produce only superficial or obvious images? Whether visiting new places or familiar ones, I think there is not very much difference in one’s motivation to take a photo. Such a motivation can arise only from experiencing something for the first time. In my opinion, we are compelled to take pictures when experiencing something new, no matter how small, nondescript or momentary this is. Consequently, I think that visiting and photographing the same place over and over again can be meaningful, if there is an aspect of experiencing something peculiar or undefined. “Two or three hours walking will carry me to as strange a country as I expect ever to see. A single farmhouse that I had not seen before is sometimes as good as the dominions of the king of Dahomey.”- Henry David Thoreau from Walking. 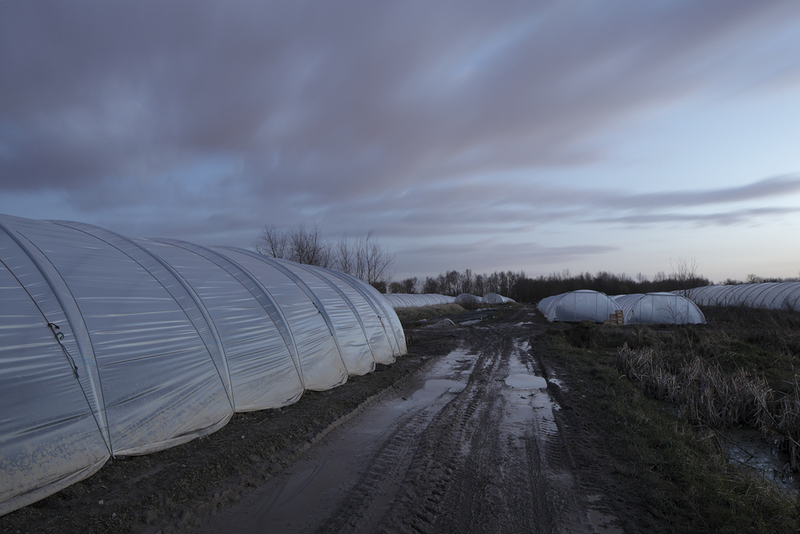 Ryan: It is evident that your photographs largely speak to human interactions with agricultural and industrial landscapes. 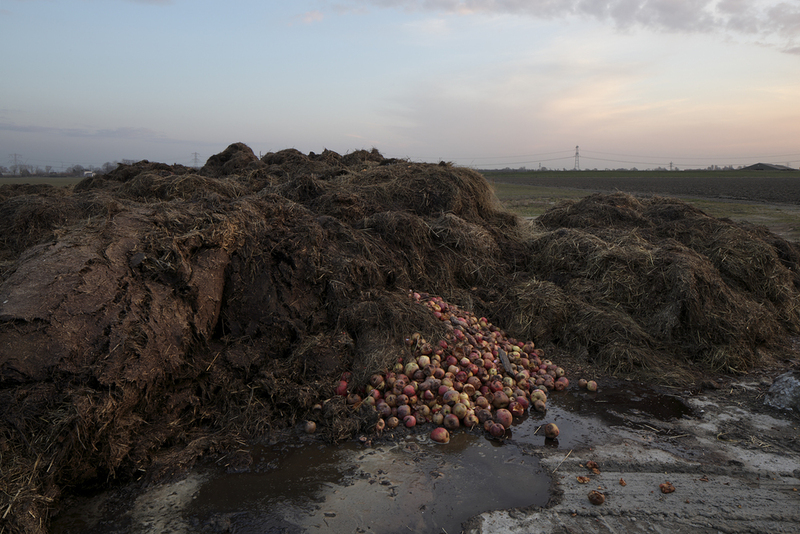 Why is it important to document the human experience relative to the agro-industrial complex? My motivation to photograph human interactions within landscapes is driven an investigation to explore the way we have changed and how we continue to change relative to our surroundings. In essence, I am driven to understand what motives people to act as they do and in the end by an even bigger question regarding the meaning of life. Our shared human experience relative to the agro-industrial complex is simply a part of this never-ending questioning. On another - more banal - level, you can simply say that changes in the landscape are a result of our goal to provide food, housing and other needs for a growing population. I look at those changes with mixed feelings; they have an upside and downside. You can see some of my images as a record of these changes and I hope that some images will bring more awareness of what is happening to our world. Earlier in this interview, I shared my doubts about the photographic image as an unambiguous and straightforward message, but I certainly believe the photo can convey human (i.e. my) experience. Finally, I would like to elaborate briefly on an - for me personally - important aspect of experiencing our surroundings. Beauty! The experience of beauty in (man-made) landscape and everyday subjects. Images reflect the surface of things and can be a source of aesthetic pleasure. When on location photographing, I have little problem being seduced by the enchanting surface of things or by the aesthetics of a place. A significant part of my photography is certainly driven by the lure or even by the pursuit of beauty. I believe the experience of beauty is an important component of the human experience and a meaningful thing in life.